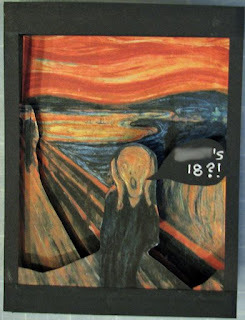 I really liked this tatebanko version of Munch's The Scream, but with postage it's something like $17 to get one to my house, and I still would have to put it together. I did find instructions for a blank tatebanko box but time was ticking away and I just wasn't in the mood to reinvent that thing. 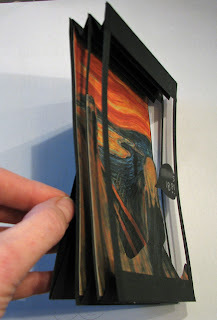 I made a tunnel book instead. I did a little bit of Photoshop on the back layer to get rid of the screamer and the two little people because I wanted them on the two other layers. Usually I would put the accordions on the sides, but this one worked better with them on the top and bottom. 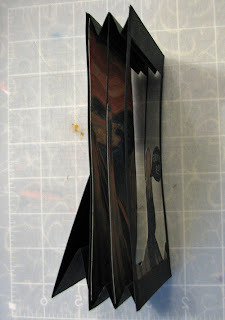 Except, it didn't want to stand up, so I made an easel stand and glued it to the back.